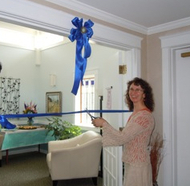 Photo: WFF Executive Director cuts the ribbon at the opening ceremony for the Casey House Meditation Room. For over two decades, Jane Berger Wolpoff meditated daily and offered her skills, free-of-charge to others in the community who were interested in meditation. It’s only fitting that the renovation of the Meditation Room at Casey House would be named in her memory. Funded by a generous grant from The Wolpoff Family Foundation, the renovations have helped to create a calm, quiet, and comfortable place within Casey House for patients and loved ones to privately reflect and meditate. In addition to supporting the renovation, the foundation funded the refurbishment of the patio at Casey House. On behalf of the board, staff, volunteers, and patients and families we are privileged to serve, Montgomery Hospice extends heartfelt thanks to Carol, Suzanne, and board members of The Wolpoff Family Foundation for their ongoing support and generosity.